The key to growth as a church, youth ministry, or a business is getting first-time guests to come back. And as any good manager of a hotel, a store, a restaurant, or an attraction knows, the key to getting guests to come back is not actually the rooms or the product or the food itself; it's how guests feel when they're there. It's about hospitality. No matter how much effort and time we spend on excellence--stirring worship time, inspiring sermons, a good coffee blend in the foyer--what our guests really want when they come to our churches is to feel welcome, comfortable, and understood. 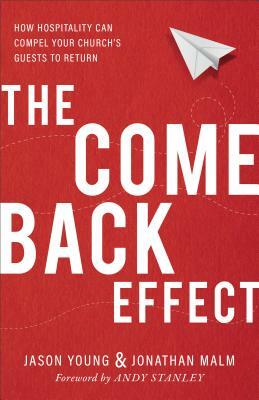 Written by a church consultant and a hospitality expert, The Come Back Effect shows church, ministry, and even business leaders the secret to helping a first-time guest return again and again. Through an engaging, story-driven approach, they explain how service and hospitality are two different things, show how Jesus practiced hospitality, and invite leaders to develop and implement changes that lead to repeat visits and, eventually, to sustained growth. Jason Young is a hospitality, leadership, and emotional intelligence coach and communicator. He is director of guest experience at Buckhead Church and North Point Ministries, a nationally known network of churches with 36,000 people in average weekly attendance. He has also worked with numerous organizations, including Ford Motor Company, Life.Church, and Chick-fil-A. Jason has written for numerous publications and enjoys posting helpful content at jasonyounglive.com. He lives in Atlanta, Georgia.Jonathan Malm runs SundaySocial.tv and ChurchStageDesignIdeas.com, reaching more than 70,000 church leaders each month. He has begun multiple businesses and consults with churches regularly on guest services and creative expression. Jonathan had the privilege of directing Echo Conference in 2013, a church conference with over 1,000 attendees. He lives in San Antonio, Texas.